An Lanntair | Isle of Lewis An Lanntair, Kenneth Street, Stornoway, Isle of Lewis. HS1 2DS. 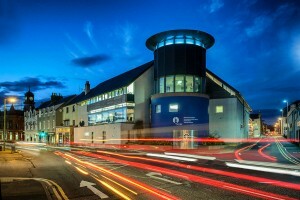 An Lanntair is a multi-arts venue; a contemporary art gallery, a theatre, a cinema, a dance studio, a concert hall, and more. Every space is stretched to showcase the arts in multiple forms. Our distinctiveness lies in placing the creativity of Gaelic culture and the Outer Hebrides centre stage. Come and join us to walk around our gallery, take in a live performance or workshop, or sample local produce and have a fine cup of coffee in our Café Bar overlooking Stornoway Harbour.